The concept behind this piece is a deserted London street. There are clues about what may have happened, the bank has been damaged, there is rubbish strewn on the ground and a pushchair has been left in the street. This is ambigious as the viewer can only speculate about why the street is barren. 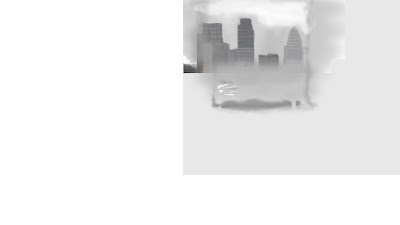 The fog brings in a eerie effect,and could even be read as being part of the 'disaster' itself. 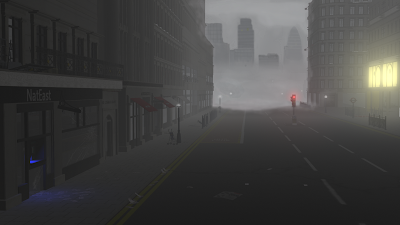 The London skyline is portrayed in the background, but it is not lit, perhaps the disaster spreads to the whole city, or perhaps it is an isolated incident on this one road. The light on the right-hand side could still be an abandoned building with the light left on, or perhaps there is sign of life. I included all these objects to create a very ambigious image. nice work Sam, reminds me of James Herbert's The Fog, the atmospherics have a certain malelovance. As if that is the disaster. Lots of positive things happening in this project. Tutorials done and a ambitous scene made and composited. Great stuff. A couple of minor criticisms. Firstly, you work hard and quickly (very admirable) but in doing so you may miss out on alternate methods of approach. Make sure to get advice early on in the project on how to technically approach your work. It can be the difference between a good scene and a great scene. This is particularly true about your lighting. I think I rushed it a little and took quite a straight-forward approach to get some progress going. Next Maya project I will take advantage of your advice! I see what you mean with the lighting, I settled for it, but it did seem quite bland and definitely needed improvement.